We love MAC Cosmetics. At least in the whole of North America, MAC is a brand that is trusted and used as the go-to store for every women looking for the right makeup products and colors. Now online on the MAC Cosmetics website and at the online vendor platform for the Macy’s superstore, the brand has decided to launch the MAC Pure + Healthy Face spring 2015 collection, which is meant to give you a flawlessly healthy look. 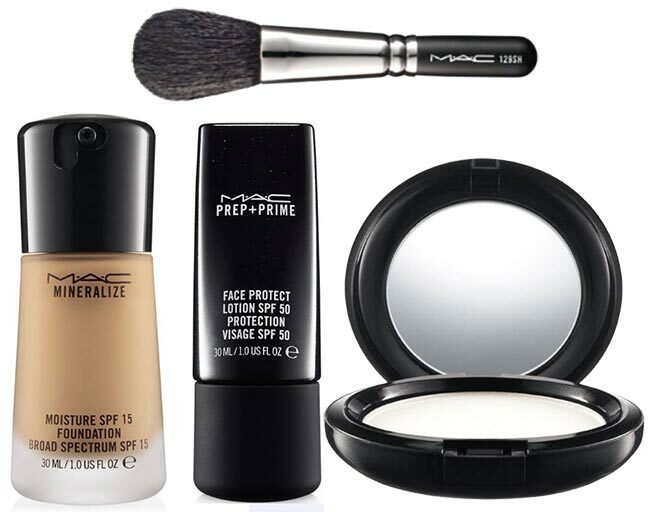 According to the MAC website, “for a Pure + Healthy Face, start with Prep + Prime Face Protect Lotion SPF 50 to smooth and hydrate skin with the added benefit of sun protection. Next, apply Mineralize Moisture SPF 15 Foundation for luminous perfection with a natural-satin finish. Finally, Prep + Prime Transparent Finishing Powder sets makeup for a totally flawless look. For professional results, apply with the 129SH Powder Brush.’ It certainly is a lot of work to achieve the look, but you will fall in love with this collection soon after getting used to the methodology and the multiple steps required getting there. The Prep + Prime Face protect Lotion is a 30 ml bottle of product that will shield your face from the sun with its latest formula infused with antioxidants and mineral-rich ingredients. The nutrients found in this item will allow for a very comfortable and non-oily finish while warding off UVA and UVB rays, preventing the appearance of sun spots, as well as keeping the skin looking youthful and wrinkle-free. The primer should be used before applying any makeup for best results. The Mineralize Moisture SPF 15 Foundation is also available in a 30 ml bottle. It is a combination of powders and creates an optical illusion, blurring away the imperfections that might be found on the face, evening out the tone and filling in the fine lines and pores. It reflects the light very nicely, has a satin finishing that feels very natural, and the product appears to light up the skin from the inside out. A 77- mineral complex with Shea Butter and Vitamin E sounds like a perfect moisturizing foundation to us. Plus, it’s available in 24 different shades to match your own as closely as humanly possible. Prep + Prime Transparent Finishing Powder comes in an 8-gram packaging, offering a silky powder to finish off the look after makeup application. It is a single shade that suits everyone and can be worn over bare moisturized skin or heavily made up faces. Of course, no makeup collection would be complete without its own shade of blush, which is available in a 129SH Powder and Blush Brush set and includes a travel pouch as well in order to keep the brush itself super clean. The shorter handles blush brush is best for application with soft fibres that are full and round, hand crafted by MAC professionals. The whole of this collection is quite enjoyable and leaves the face feeling fresh and healthy, even after all that application.